Constantine, later known as 'Constantine the Great' was proclaimed emperor in 306. His reign was notable for the fact he had to handle problems that no emperor had ever had to face before. Most Emperors had gained their reputations by conquering foreign lands and naking the Roman provinces, with the natives becoming Roman citizens. Until now, the Romans had founded their fears of attack on the empire on physical invasions by outside forces. They knew only combat and war and accepted it as part of life. Constantine, however, had to face an invasion by a force whose foundations were made of peace, harmony and non violence. Galerius was opposed to the idea of Constantine being released from his duties in the eastern hemisphere. to join his father in the campaigns against the Scots in Britain. Originally he was given the rank of Caesar, one below the ultimate title of Augustus. This was a political move as Galerius put forward his own candidate for emperor, Maxentius in retaliation. Without this move, Constantine would had been appointed with the highest rank of Augustus. When Constantine arrived, Diocletian was the governor and he was in the throes of bringing in reforms to the constitution. Constantine was known as an emperor who liked to spend on building and improving military and civil structures. This was demonstrated at York, where extensive rebuilding work was carried out early in his reign. Within one year of his governorship, there were no less than six out of nineteen milestones that bore his name He was very much a doer and believed in visiting his provinces on regular occasions. It is known he stayed in Britain in 307, 312 and 314, as is evident by the coins issued at that time. Britain did not have the problems that beset the European provinces, so there was more cash available to spend on projects. Cities had their fortifications strengthened. Walls appeared around towns that were perviously open on all sides. This money was not restricted to military fortifications. The local dwellings of the landowners were improved. Some to the level of becoming mansions. The next significant action that is apparent was a reduction in the number of troops that were billeted in the forts. This was reasonably assumed to be because the troops were allowed to live outside the confines of the camp amongst the civilians. As many of the troops had married local women, they were now being allowed to spend more time with them. This also reflects the high degree of peace that must have prevailed in Britain at that time. 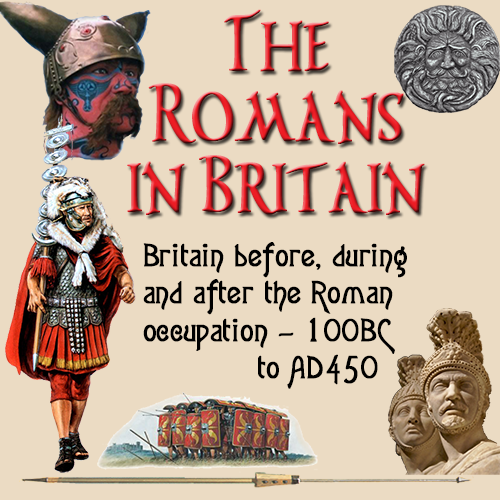 Constantine's changes to Britain did not consist purely of construction projects. He took a bold step and disbanded the praetorian guard and made new ranks of 'Master of cavalry' and 'Master of infantry'. The creation of these posts and the Constantine trait of recruiting foreigners into the army, particularly Germans and promoting them was scorned upon from many quarters. He was accused of diluting the Roman military with unreliable imports. The question was 'if it Britain ever went to war with tribes from Europe, would these new recruits desert and join the foreign ranks?'. The Roman philosophy of promoting from within, regardless of status and race had developed a great number of non Roman superiors, which could be seen as dangerous. There was also the trait of bringing civil and military posts closer together. Many civil posts now had titles that had equivalents in the military. They were allowed to wear military type uniforms with insignias. These changes to the military structure may have had political rather than practical motives. The praetorian prefects were responsible for administration and recruitment into the military. Their workload was heavy during the later part of the Roman Empire and were increased under Constantine, but it was also highly influential. Most of the prefects sided with Maximus, who was directly opposed to Constantine's policies. Inflation is not a 20th century invention. It appeared long ago and was part of Roman life. Constantine began a series of reforms in the civilian field as well as in the military. One of these reforms concerned the way in which taxes were calculated. Previously, the taxes had been determined by setting definite amounts of money or percentages. The first method did not produce sufficient amounts during periods of high inflation, the second did not enable the government to predict the amount of tax they would receive. Diocletian introduced a method of taxation that measured the land of the individual and expressed the tax payable in units according to the size of the property. This enabled the landowners to realistically estimate the tax due. The tax level of each unit had been preset and would enable the government to accurately set the tax rate according to the expected spending in the next period. Then a radical method of paying taxes was instigated. Instead of payment in cash, it became possible to settle by paying in kind. This was soon to be beneficial to everyone. Goods and necessary items could be passed directly to the state and they in turn could pay suppliers in kind. The main benefactor was the army. They could receive supplies directly without the need to buy them for cash. It was also the case that some goods were translated into cash. In a period of high inflation, these new methods of tax collection and distribution would help to bring about a stable currency. As the reforms brought about flexibility and stability to the economy, they also brought new problems. The complexity of the administration increased the number of people it took to manage the system. This meant the cost of collecting taxes increased, which was counter productive to the reforms. To overcome this to a certain extent, the central finance department was reorganised by separating the administration into two halves to handle the cash and the payment in kind aspects. Along with the new system, the method of communication was made more efficient by having the new system administered by the local praetorian prefects. Another aspect of the changes made the collection of taxes easier to administer from Rome. Previously it had been abused along the chain by those less than honest. Constantine had a reputation for pressing ahead with change not only in administration, but in every aspect of daily life. He had enthusiasm for life and his work which became infectious and spread a tide of hope throughout the country. He had the ability to be flexible in his dealings, which made him popular He was a tolerant man who embraced new ideas. This extended towards the subject of religion and although he was not a Christian, he allowed the faith to grow in Britain. Word spread amongst the European Christians. It is reasonable to assume that many did come to Britain, to seek refuge from the hostile attitudes to their faith primarily in the more southerly parts of Europe. To show his inclination towards the Christian belief, he gave back to the church the property that had been taken from them years before and donated large amounts from the treasury to the faith. in 324, he sent funds from Britain to the church in eastern Europe to help rebuild churches that had been destroyed before the religion had been legalised by a proclamation from Rome. The traffic in cash was not just a way way street. The church in it's own right was wealthy beyond the imagination and as such could weld influence on those in power. In spite of the barbarian raids and their seizing of valuable treasures of years gone by, the church still retained substantial prosperity. Such was the affluence of the faith. Constantine may have been a great reformer, but he was also human and it was a known fact that in the transfer of riches, some were 'lost' on the way. How much of this went in his direction is not known, but any human will succumb if the temptation is great enough. Constantine then made a change to the constitution that shocked the conventionally minded Romans. He transferred powers to the church that had previously been granted to local magistrates. Most legal disputes were settled with the help of a magistrate and a solution found that would fair and just. Constantine placed this power in the hands of the church bishops for them to decide the case. This practice only lasted a short time, and illustrated the extent he would go to to reform Britain. Coupled with the way in which funds 'disappeared' on route as mentioned earlier, the suspicion of corruption cannot be discounted. This acceptance of Christianity was not welcomed by all Romans in positions of influence. Many still believed the pagan faith must survive. Organised public rituals and sacrifices were still happening regularly. These were seen as demonstrations of loyalty to the army and established civilian life. It was felt by these people that the Christian religion had taken a hold too fast. The appointment of bishops to positions of authority in civilian life had caused concern amongst those who could see the Roman traditions declining in importance. This caused considerable conflict between the orthodox Romans and those who wanted to accept Christianity as the new path to follow. By the middle of the third century, it had become increasingly important to follow a religious belief of some sort. It was apparent that sooner or later matters would come to a conclusion with one side becoming the dominant faith. Christianity, although becoming more popular, was still a persecuted religion in many quarters. The fear of secret chambers plotting against the Roman state. Whispers of conspiracies to overthrow the Roman nation and replace it with a foreign based administration brought fear to the Roman upper class and those in power. It became common practice by traditionalists to blame any misfortunes as the Roman gods expressing their anger at the new religion. To exaggerate these claims, they put about stories trying to link Christians to extremists militants in the east of the empire. Constantine embraced Christianity and showed it publicly. It was the only way he would hold onto his position and anyway, the situation was now at a stage were a belief in any religion was vitally important in civilian and political life. In many areas of the state, being a Christian was not only beneficial, but also essential to the membership. The Roman ruling classes were still adverse to accepting the new ways. To appease them, Constantine reorganised the chain of command by rasing the status of many posts so that their careers would be strengthened. For example, the post of some provincial governors was upgraded in status to consularis. This brought them into the ranks of those who were eligible to be considered for the rank of senator. By appealing to their ambitions, he hoped this would win them over to his point of view. There was still one aspect that needed o be addressed. To qualify for the senate, the candidate had to be very wealthy. Constantine overcame this by using the monies from spoils captured in wars and from extra income received from the new methods of taxation. He used these funds to increase the wealth of the nominee to a level where they could be considered for acceptance to the senate. He was accused of favoritism by those who did not benefit from this arrangement. This was ignored. From Constantine's point of view, if it helped his cause, he considered it justified. These new reforms he brought in had many effects on the economy and everyday life. A new gold coin had to be introduced, the solidus, to cope with the vast increase in expenditure. The increase in bureaucracy to handle the administration enabled a rise in employment, not only in these posts, but also in the industries that provided services to the government. Even so, the beginning of the fourth century saw Britain in a state of opulence never known before. There was a down side to this though. Those with greater wealth paid less in tax by percentage than those less fortunate. As the number of rich authority figures increased, so the tax burden on the rank and file became greater. It reached a level where even Constantine had to intervene and pass laws to ensure the public finances were at a level to handle the growing aristocracy. While he was alive, Constantine ruler with an iron hand. He built up the prosperity, particularly in Britain to a remarkable level. This is particularly significant, as he was emperor at a time when Britain needed a different style of leader. Constantine had without doubt been brought up and trained in a time when military expertise was seen as an essential attribute for an emperor. He, however, had to control an empire where the greatest problems involved a peaceful invasion, and an economy that was in bad need of reform. Neither of these were areas that any emperor had experienced. He handled the whole situation in a commendable manner. When he died in 337, he had been rewarded with the rank of Augustus and had been given the title of 'Constantine the Great'.